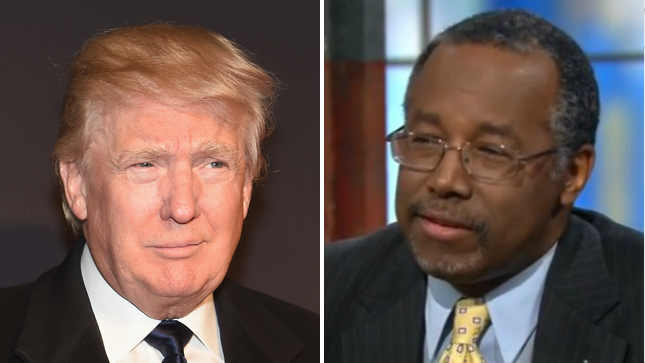 Retired neurosurgeon Ben Carson and businessman Donald Trump are neck-and-neck for the GOP’s 2016 presidential nomination in Iowa, a new poll says. The Bloomberg/Des Moines Register survey released on Saturday finds that the two are tied in Iowa caucus-goer support when voters’ first and second choices for the Republican coronation are combined. Each is the first or second choice of 32 percent of respondents. “Trump and Carson, one bombastic and the other sometimes soft-spoken, could hardly be more different in their outward presentations,” said J. Ann Selzer, president of Selzer & Co., who conducted the poll, according to Bloomberg. “Yet they’re both finding traction because they don’t seem like politicians and there’s a strong demand for that right now,” she added. Saturday’s poll found that Trump is vastly improving his position in Iowa since launching his presidential campaign in June. The survey found that Carson is buoyed in Iowa by his likable public persona and his vocal Christian faith.